Designed artefacts may be quantified by any number of measures. This paper aims to show that in doing so, the particular measures used may matter very little, but as many as possible should be taken. A set of building plans is used to demonstrate that arbitrary measures of their shape serve to classify them into neighbourhood types, and the accuracy of classification increases as more are used, even if the dimensionality of the space in which classification occurs is held constant. It is further shown that two autonomous agents may independently choose sets of attributes by which to represent the buildings, but arrive at similar judgements as more are used. This has several implications for studying or simulating design. It suggests that quantitative studies of collections of artefacts may be made without requiring extensive knowledge of the best possible measures—often impossible in real, ill-defined, design situations. It suggests a means by which the generation of novelty can be explained in a group of agents with different ways of seeing a given event. 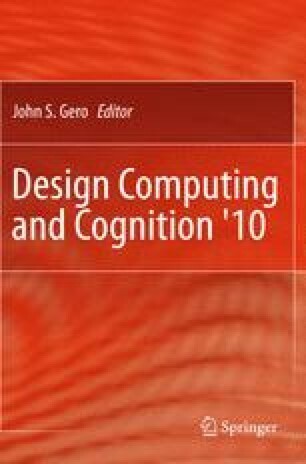 It also suggests that communication can occur without the need for predetermined codes or protocols, introducing the possibility of alternative human-computer interfaces that may be useful in design.